The recent national headlines of piranha fish being found blocking drains in Telford, Shropshire has yet again highlighted the problems that can be caused through disposal of anything other than normal waste. UKDN Waterflow’s state of the art CCTV survey equipment is used around the country to locate and deal with such blockages. Operating colour CCTV systems that can work in pipe diameters from just 75mm up to major sewers 2000 mm in diameter specialist teams also have explosion proof cameras for special environments, pan and tilt cameras for exacting surveys and satellite camera systems that can survey a main sewer and send a satellite camera 30m up a lateral connection. The significant size of the UKDN Waterflow fleet of CCTV survey units makes us one of the largest providers of this service in the UK. False teeth – when the drain was jetted they jumped out of the pipe, scaring the life out of the engineer! Gary Webb, from UKDN Waterflow commented “The drains that take wastewater away from homes and businesses are usually only a few inches wide and are only meant to take water, toilet roll and human waste – certainly not piranhas or false teeth. 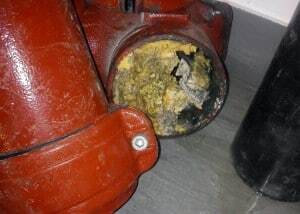 Blockages of this nature can cause major headaches for households and businesses alike and can be cleared by UKDN Waterflow using high pressure water jetting. Where the blockages are more difficult mechanical boring, root and concrete cutting devices are used. If the blockages are the result of a failure of the pipe itself UKDN Waterflow can carry out any necessary pipe rehabilitation, often using no-dig solutions to minimise disruption. So the advice from UKDN Waterflow is simple. Avoid the horror of sewage flooding inside your home or business. Don’t flush anything other than the normal, and if you suspect something is going on with your drains get a qualified drainage engineer on site to investigate.